Rain gets a bad rap. How many times have you heard complaints about a rainy day? I do love sunshine, but I also love rainy days. And even better a thunderstorm, not a damaging storm, just rolling thunder and gentle rain. As I write this, the morning sky is gray and water puddles stand in the driveway. Thunder woke me at 5:45 a.m. and then I heard the rain. I opened the shutters and raised a window and sat close as I drank my first cup of coffee. A perfect way to begin the day. I wouldn’t like rain every day, I’m not in favor of moving to Oregon where rain falls 164 days yearly, but I surely like a good rainy day. And I’m not the only one. 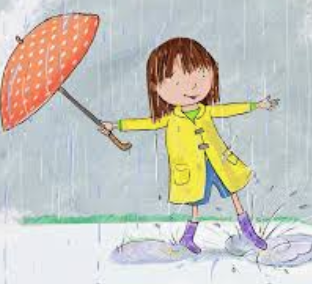 Three-year-old Jess said, “Yay, rain puddles. Stomp!” Have you ever seen a little kid walk around a puddle? Jess stops at a puddle’s edge and jumps right in the middle with both feet or stomps with one foot, then the other. Elaine, age 6, likes rainy days to play in mud and be messy. She slathers her body with mud. Elaine doesn’t need spa treatments to reap the benefits of mud baths. Mud baths are advertised to soften skin, detox the body, improve circulation, and relieve stress. If these claims are true, my Grand should be calm and healthy. “Mom won’t make us go outside to play,” said Lou, age 10. This Grand is happiest holding a book in her hands. “We get to watch TV more on rainy days,” said, Ruth. But when outside, both these girls are right beside their younger siblings stomping puddles and playing in mud. My Grands take me back. As a kid, I patted dozens of mud pies and meatballs. I liked the feel of sloppy wet dirt squishing through my fingers. But one of the few times I remember Mom really being angry with me was a rainy day. I was about eight when she let me use her red umbrella to walk in the rain for fun. I played in our front yard, running barefoot through standing water, and then decided the umbrella would make a good boat. Mom wasn’t happy that her good umbrella was upside down, soaking wet, and the underneath side plastered with wet leaves. Leaves that stained. I admit I’ve chanted, “Rain, rain, go away. Come again another day.” When I taught a class of 28 sixth-grade students, I hated rainy days that prevented outside recess and walking around the school building after lunch in the cafeteria to take the long way back to our classroom. And when Daughter and Son-in-law’s wedding reception was planned for our backyard, I cussed the four days of non-stop rain. I planned to write a happy, enjoy-the-rain ending for this column. But I can’t. I went grocery shopping at 4:15 p.m. and walked in drizzling rain and darkness hit and my hair frizzed and I was cold and damp. No wonder rain gets a bad rap.